Direct connection to the network: 1 serial highspeed port to the optical network. Especially when bridging long distances up to 2000m, such as found in distantly located facilities or even in cross-building connections, the use of glass fiber optic cables is the ideal transmission medium. Network side galvanic isolation to almost any desired level, with no susceptibility to electromagnetic noise compared with copper based solutions. Likewise, fiber optic cables emit no noise of their own. Like the other Highspeed series models, the Com-Server Highspeed 100BaseFX offers everything you need for direct connection of a serial port to the computer network in the smallest possible space. 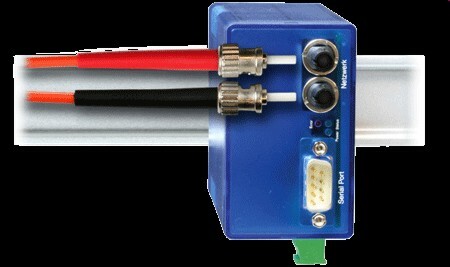 All protocols are included (see box and applications behind the product data sheets). 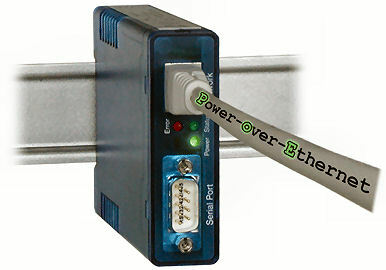 The serial port on the Com-Server can be switched to RS232, RS422 or RS485. The serial and network parameters are configured using Telnet, ARP/RARP, SNMP or via the Internet browser and the integrated Web Based Management function. The W&T COM Port Redirector for Windows 9x/NT/2000/XP/2003 also gives serially operating Windows programs the ability to communicate over the network. Virtual COM ports are installed on the system which behave like standard COM ports with respect to the applications. Communication with the terminal device is now however over the network and a Com-Server. For items not included See Accessories page.